Before email, texting, Facebook or Twitter, the humble school spirit rock was the workhorse of social media. From birthday greetings to daring prom date invites to rivalry game touts, communities have long been able to count on the rock to deliver must-read messages. 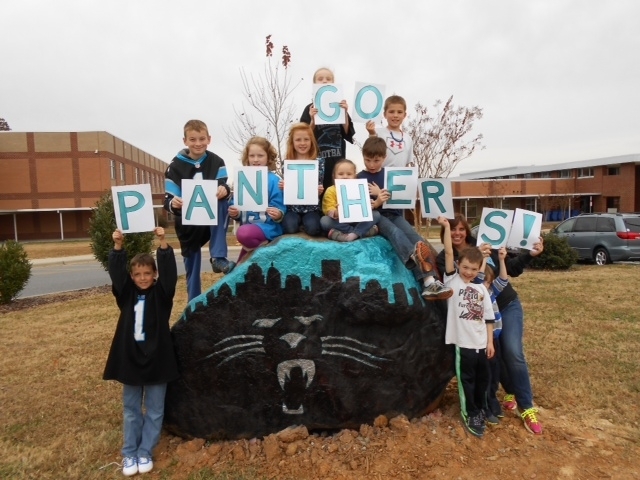 The 5th Annual Spirit Rock Contest, sponsored by the Carolina Panthers and Allen Tate, gave elementary, middle and high schools in North and South Carolina the opportunity to celebrate the tradition of the school rock to show their Panthers pride while encouraging creative arts expression. Ten winning schools, selected from dozens of entries by a community panel of judges, received $5,000 in grants to support school art projects. The top rock honor (pictured here) went to Carl A. Furr Elementary School in Concord, N.C., who received a $1,000 arts grant. Piedmont High School, Monroe, N.C.
Rea View Elementary School, Charlotte, N.C.
South Mecklenburg High School, Charlotte, N.C.
Davis Drive Middle School, Cary, N.C.
East Gaston High School, Mount Holly, N.C.
Landsdowne Elementary School, Charlotte, N.C.
Northeast Middle School, Charlotte, N.C.
York Comprehensive High School, York, S.C.
“The Spirit Rock Art Contest combines three things that Allen Tate Company is passionate about: education, arts and culture and of course, the Carolina Panthers. We are honored to be associated with this great promotion,” said Pat Riley, Allen Tate president and chief operating officer. Top finishers were recognized in-stadium during the New Orleans vs. Carolina Panthers game on December 22. Photos of the winning rocks are currently displayed on a slide show on panthers.com and will be featured in an upcoming issue of the Panthers fan magazine, Roar. Allen Tate Company has been an official sponsor of the Carolina Panthers since 2007.